The elevator pitch is a crucial element of any startup’s identity. And it’s especially vital when selling your idea to investors. Organizing your thoughts and effectively structuring your pitch will go a long way in ensuring your companies success. And one of the best tools for developing an amazing pitch is with mind mapping. Mind maps are visual diagrams used to represent your ideas and concepts. This visual thinking tool will help you solidify your message, structure information in a clear way, and even generate new ideas. Think of your mind map as a visual business plan. Like your business plan, you will need to include everything from information about your products and services to your branding, market strategy, and financial plans. Start your mind map out with what we call a “mind dump.” Lay out every piece of your businesses puzzle, without consideration for how it should be structured or organized—at least not yet. The goal is to collect as much information as possible to get a better big-picture view of your pitch’s strengths and weaknesses. Not every piece has to be detailed to the number, but each piece of your business plan should be represented in some way or another on your diagram. Begin organizing your mind map. Once you’ve visually represented each piece of your business plan, start organizing. Create categories and subcategories for related elements. As you go, you may realize that pieces that should be there are missing. Take note of these by adding them to the diagram; these are key insights into where your team needs to direct their attention. Once you have a complete picture, your mind map will likely be too large to function as a presentable piece of information to outsiders, but it’s an invaluable visualization for you. And it’s the starting point for you to begin breaking each piece into greater detail. Within Cacoo, you can create different sheets within your diagram where you can more clearly explore the details of each section of your mind map. By the end, you may end up with a whole series of tiered mind maps, each conveying a visualization of a key part of your business. These different tiers of mind maps can eventually serve as the visuals that go with your finalized pitch. Your pitch will start with the big picture, and then work its way into the granular details. Connect this series of visuals into a narrative that tells the story of your business in a meaningful, detailed, and cohesive way. Walking your potential investors through a well-thought-out, visual plan of where you see your company going—and how—is a powerful tool for acquiring impassioned backers. The final piece of the puzzle is to take your well-structured, detailed plan and dress it up a bit. Make sure you’re using high-quality, consistent colors, images, and shapes. A beautiful deck isn’t going to save a fundamentally bad idea, but it can put you over the top when you’re up against equally great ideas. Remember, these visuals shouldn’t feel like a chore for investors to wade through. They should be concise, clear, and uncluttered. They should help viewers make the connections you’re explaining verbally. When possible, provide graphs and charts within your mind maps to further enhance the visual experience of your pitch. Keep the nice-to-know information on hand. While giving a pitch, investors may ask for more detail. Always keep handy a separate file of documents that could be useful to an investor should they ask. These can be attached to your presentation later for those interested in diving deeper into a particular detail. Competition for startup funding in today’s market is fierce. To stand a chance, you need a high quality, organized pitch. The more time you spend perfecting your pitch and startup plan, the better it will be. If there’s one area of your business plan you can’t afford to skimp on, it’s how you sell it to investors. What are your favorite tips for organizing your elevator pitch? Share it with us on Twitter! 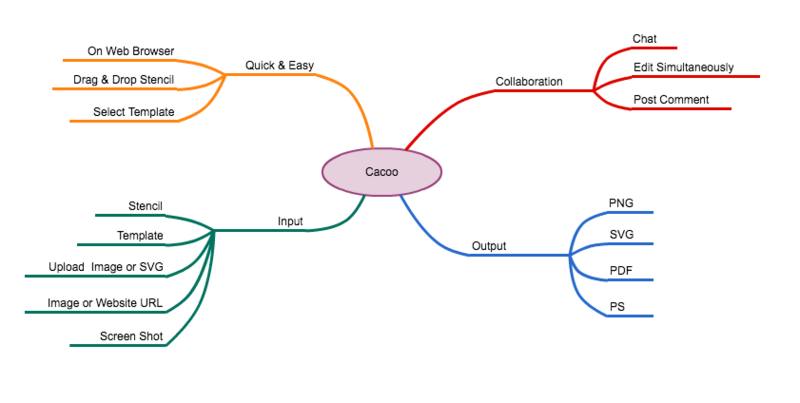 Check out Cacoo, a diagramming tool for better team collaboration.